This is part of an on-going series highlighting Marksmen Corporate Partners. FAYETTEVILLE, N.C. – You know ’em, you love ’em – it’s world-famous Bojangles Chicken and Biscuits! With no real introduction needed, we proudly welcome aboard one of the South’s most beloved and delicious restaurants. This year, you’ll be seeing plenty of Bojangles when it comes to Marksmen Hockey – and that’s no coincidence. 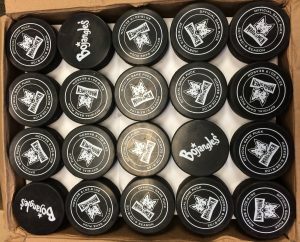 Every single game puck that the team uses this year is embedded with our world-famous fox Marky on one-side, and the instantly-recognizable Bojangles wordmark on the other. Alongside that, every puck that goes out of play in the Crown Coliseum this year will be brought to you by Bojangles. Bojangles and the Marksmen have more in common than just the partnership and the satisfaction of enjoying them. Both organizations are born-and-bred in North Carolina, with the first Bojangles opening up in Charlotte in 1977 – that’s where our owner Chuck Norris lives! There are over 600 Bojangles scattered across the East/Southeast regions of the United States, but the brand has found its way internationally on a few occasions. 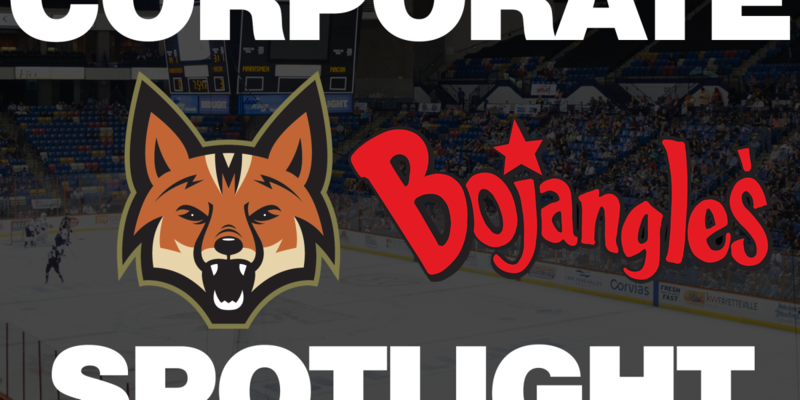 When you think of Bojangles, think of Marksmen Hockey – two organizations born in North Carolina, and known for doing their best to make every person a fan. We are proud and excited to have Bojangles aboard for the 2018-19 Season, which promises to be one of success on multiple levels. The 2018-19 Marksmen Home Opener is October 19th against the Roanoke Rail Yard Dawgs, and Season Tickets are on sale NOW! If you’re interested in partnering up with the Marksmen organization, or hearing about our season ticket packages, group packages, mini-plans, or advertising benefits, email Director of Digital Marketing and Media Shawn Bednard, SBednard@MarksmenHockey.com or call the Marksmen Office at (910) 321-0123.